In this issue of Woman & Home : "woman&home recognises that 35-plus women today can't be pigeonholed like previous generations. What unites them is their ‘can do' attitude - an attitude we celebrate and inspire" Sue James, editorial director. 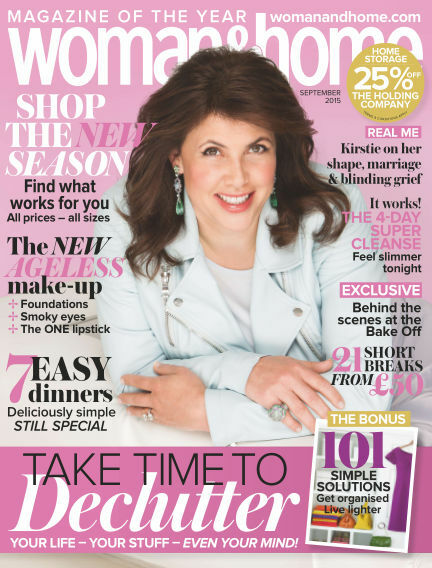 A real success story, woman&home continues to grow each year making it the lifestyle magazine of choice for women over 35 today. woman&home is a true 360 degree brand. Not only does it engage with nearly three quarters of a million readers every month in print but it also interacts with nearly another half a million through its website, mobile site, social media presence and forums. With fashion advice, beauty tips, recipes and much, much more, womanandhome.com is fast establishing itself as the online destination for women over 35.
woman&home also takes great pleasure in building relationships with its highly responsive and engaged readership and runs a host of events throughout the year from shopping events, lunches at key events such as The Cheltenham Literature Festival and Pink Ribbon Walks for Breast Cancer Care. woman&home has expanded its brand in print, publishing two quarterly magazines Feel Good Food and Feel Good You. With Readly you can read Woman & Home (issue September 2015) and thousands of other magazines on your tablet and smartphone. Get access to all with just one subscription. New releases and back issues – all included.